Fall has arrived. Usually I hit the gym first thing on Saturday morning and then I come back and walk Thing Two. This morning I was actually shivering while I walked him because I was still wet from the gym and it was in the 60s. It was a perfectly cloudy day and a cool breeze blowing. Cooler weather means yummy smells of cinnamon and nutmeg to me. And of course… pumpkin!!!! What better way to start the day than with pumpkin waffles. I love pumpkin. I love waffles. How could I not venture into the realm of mixing the two and making my house smell like a Fall waffle festival. I made these with protein powder instead of regular flour so that I could replace the protein in my breakfast after my workout. When I’m baking for The Kid, I use Plant Fusion protein powder since it is not dairy based. I’ve tried both their vanilla and chocolate flavors and like the texture of both. I used the vanilla in this recipe since that sounded good with pumpkin and cinnamon. I also used almond milk as the milk of choice. Make sure to use plain canned pumpkin and not pumpkin pie filling. There’s a big difference in the two and they are not interchangeable. Preheat waffle iron. Mix all ingredients in a bowl until well blended. My batter was really thick so I added a splash of water. It was still thicker than waffle batter even after the water but you don’t want it too runny. It was about yogurt consistency as a reference point. Bake in your waffle iron according to directions. Makes 6 waffles. 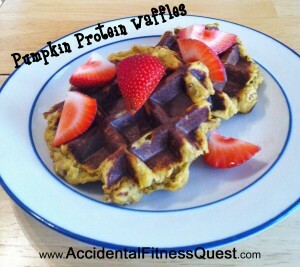 Each waffle is approximately 80 calories and 4.3 g carbs, 2.3 g fat, 10 g protein. I’m also pondering a banana chocolate version to see how those turn out. If you give these a try with regular protein powder, let me know how they turn out. Happy Fall, y’all.